This past weekend I went out & purchased a few items for the floating IKEA cabinets I posted about here. The flowers are silk flowers I purchased awhile ago, don't recall where (sorry) but you can find them online I'm sure! They feel really nice & I love how they look in person! The white vase the flowers are in is from West Elm. 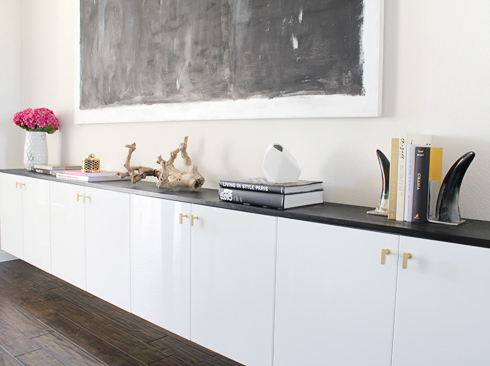 The little white vase pictured above is from ZGallerie. It's so cute & lightweight, can easily be moved around the house. 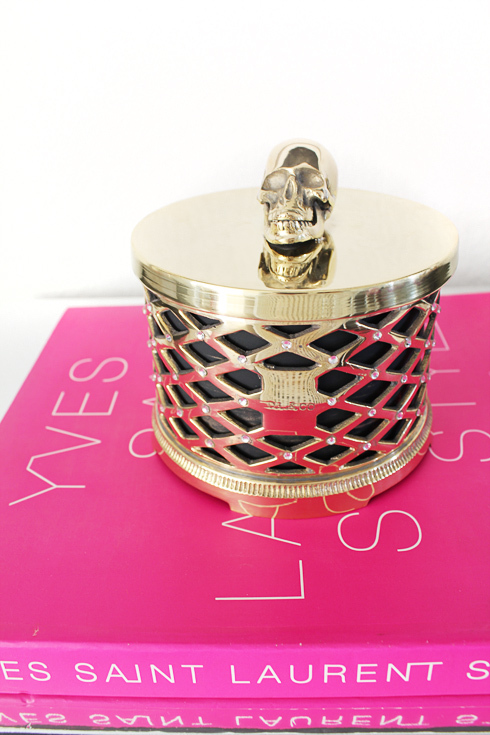 This polished brass vessel (below) holds a black candle from D.L. & Co. that is one of my favorites! Isn't the skull super cool?? The scent of the candle is made up of opium poppy, a blend Madagascar vanilla, green pepper, pink lotus, and perilla absolute. It is just amazing! Available at Barneys New York. I've always wanted a piece of driftwood & instead of hunting for it myself in some town or buying it on Ebay, I decided to buy the one I saw at ZGallerie. It was perfect & super affordable at only $25! So, what do you think so far? Love this candle, so cool! Looking really fantastic! Well done Jen. It's great to see your personality shining through your decor. Great choices! I am loving the pink flowers...always a good look! This looks fabulous Jen - lots of well-chosen things but not too forced which I believe is always a challenge when needing to fill a whole new space. Also loving your new Coco & Hearts pieces! Looks very "you" and I love that. Personal design is the way to go - not focusing on what is trendy or adhering to random rules. So glad you mentioned about the flowers, I have been ogling them. Didn't know silk flowers could look so good! Jen! I absolutely love it. I like the height you have now it makes it feel more spacious and breezy!! This is my favorite Ikea hack I've ever seen, and I love how you have decorated it. The flowers are perfect and I even think the driftwood looks great, and I hate driftwood as decor! You're awesome, Made By Girl! One question...where did you get those amazing bookends??!! It looks really fantastic. I love the dark top with glossy white doors. Really fantastic! Nice job! The cabinets look fantastic! Love the accessories, especially the little pops of pink. Looks fantastic so far :) The flowers make the space feel so much more vibrant. I was going to ask where those book ends came from too, but I was beaten to it! They're gorgeous! Cuuute accessories! This is something I have always struggled with. Especially getting the perfect thing and making it look perfectly imperfect! :) These are really cute examples. I especially like the use of the natural elements-- flowers and driftwood. Also scull vessel is very cool!! Beautiful! Nice choices! Very clean but sophisticated. I like books in decor. Let me know when you want another piece. I'll go to the beach and get you a nice chunk! I could use the extra cash! 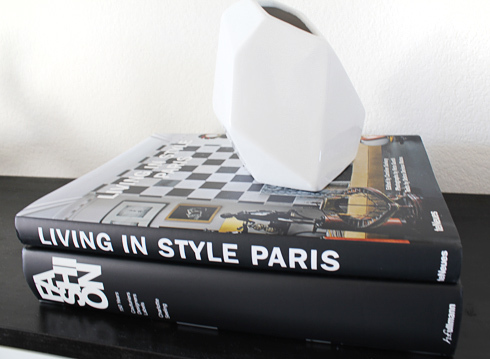 I love how you styled it and more books are a great idea. The floating cabinet is a great idea for a long wall - love it! Looks amazing !! Love the stacked up books and in love with the skull candle !! VICTORY PAPER DESIGN: I can totally sympathize....i kill plants too! ha! Dude, your house is killing it! I LOVE it Jen! So inspiring! Absolutely Gorgeous. You have such good taste Jen. I love your sense of style. I knew you wouldn't have trouble coming up with something fabulous-looking (even if it is just a start)! So chic! I love it :) I think you added the perfect amount of color and the driftwood adds a little rustic touch. Beautiful! Love the mix of elements~driftwood,brass,bright white,black and pink. Love your accessories especially the pop of color on the faux hydrangeas and the driftwood! Well done, Jen. lovin the knobs on the cabinet. The pink gives it a nice flirty touch. Totally gorgeous amazing! I love the brass knobs! Great job! Glad I'm not alone in the love-of-driftwood department. I have a huge West Elm lidded jar that displays several pieces, as well as tumbled glass I picked off the beach in Italy. I love the whole look, even though most people don't understand it! I'm also dying for your cabinet and hardware by the way. DYING I say! Oh Jen!!! So many people get stuff like this wrong, but you have NAILED it! The knobs are SO amazing, and wow! I just can't ge over what it does to the space. Your home is looking like it's ready for Elle Decor to come knocking! Hope your back is feeling better, if only slightly. Mr Tonic fell down some steps last weekend (ambulance called and everything! ), but he is also slowly on the (back) mend. PS LOOOVE that skull candle. How great is that range!! What type of cabinets from Ikea are those??? iPad 2 Case GIVEAWAY !!!! New Paintings in the Cocoa & Hearts Gallery! !